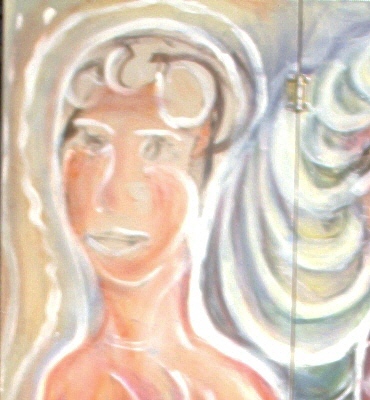 How would it feel to walk into a beautiful, uplifting space, filled with original, rich, rarely publicly viewed painted expressions of Goddess archetypes? To have contemplative time with these activational paintings at your own pace, enriched by the option to listen to healing, uplifting meditations inspired by their archetypal viewpoints? To more fully recognize, connect with and benefit from your own internal Goddess nature? To connect through the heart, compassionately witness and be compassionately witnessed by others who are also drawn to their goddess nature? To be fully present for a live recording of a new healing and empowering meditation inspired by Goddess of Love Aphrodite? I invite you to be part of this event, to more fully activate and strengthen your own unique Goddess nature and connection, for increased harmony, balance and healing whether you are male or female, and to receive the benefits of caring group interaction. These meditations and paintings come out of my own personal healing and creating process of the last 13 years. I’m honored to have this opportunity to share them with you in the perfect setting of Joy Center in Ishpeming, MI from 1 – 3:30 pm on Sunday, Feb. 24th. Your Inner Goddess Experience will include a Himalayan Heart Activation, both live and recorded meditation plus contemplation opportunities, deep journaling and sharing time, and same-day discounts on my Goddess posters, prints and meditation CDs, plus upcoming full-day Goddess retreat. Pre-registration is required as a limited number of spaces are available. Early bird fee: $25 with pre-payment to ILC, PO Box 583, Marquette, MI, 49855; $35 after if space available. In the meantime, you can click here to listen to Blessing from Lakshmi, Goddess of Prosperity from my new meditation CD, A New Radiance: Chakra Blessings from the Divine Feminine or contact me to purchase your own copy of the full CD. Please feel free to reach me at info@intuitivelearningcreations.com or (906) 228-9097 with any questions.